Wait–where are the tomatoes again??? I’m sure there is more that I’m forgetting! This time of year, it is hard for me to stick within my budget because everything is sooooo tempting! And distracting. And lovely. Happy shopping! It is only March, and already the temperatures are in the 80s here in North Carolina. I’m not sure what that means for summer, but for now, it feels great. We spent the weekend working outside, getting our raised beds ready for planting and watching basketball (Go NC State!). Ok that last one involved being inside, but we did have the windows open. In the winter, I love to bake and bake and bake, but once the weather turns warm, I want to be outside. 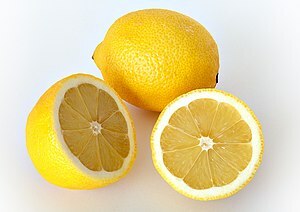 My menus turn to quicker meals, grilled foods and all things lemon. Organizing the refrigerator yesterday, I noticed that we had a ridiculous collection of cut lemons. We’ve had several dishes lately that called for lemon zest, but not the juice, leaving us with the equivalent of two lemons that were begging to be used. And since one of our goals is to not waste the food we have, I called on a familiar recipe to turn lemons into…well…lemon bars!